Compaction grouting is a type of pressure grouting that becomes more denseand compacts soil that is in need of stabilization. 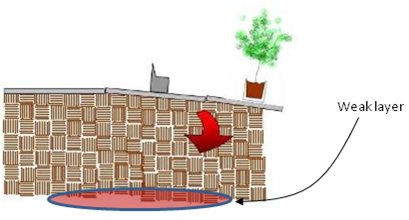 For foundation repair it is most effective in stabilizing non point load bearing structures such as swimming pools or flat pads and pavements (interior floor pad). It can be performed either top down or bottom up. Most flat structures settle because of soil being too heavy to support itself. Ten feet of soil on top of a weak layer can cause it to compress. The surface then follows the rest of the soil causing distress in the pool, pavement or any structure located above the problem. To correct the issue the soil stabilization is needed. 1. First, the injection casing is driven to the proper depth. This can be done in one of several ways. The simplest is to hammer down the casing with an air powered driver or a hydraulic powered hammer. Sometimes pre-drilling is required when penetration through harder soils is required to reach unconsolidated soils. Usually with a down in the hole hammer. This is a common step that is often not followed with vigilance. 2. Once the proper depth has been reached. Grout is then pumped down and injected. For compaction grouting (pressure grouting), a very stiff mix with in internal high friction is used. For true compaction grouting, a 2” diameter or larger casing is required. Any casing less than 2” is not true compaction grouting. Grout pressure and volume should not be large enough to fracture the soil. 3. Once a volume, pressure or ground movement marker has been met, the casing is raised 12 to 24 inches and the same grouting process is repeated. 4. This grouting and lifting procedure is repeated until the surface is reached. The finished work results in successful soil stabilization. Compaction or slurry grouting is a process that should be done under the direct supervision of a licensed geotechnical engineer (who is independent of the contractor to avoid any conflict of interest. In order for this type of repair to be effective, deep soil testing must be done by a competent soils testing engineer. An effective grouting plan can then be designed that will take into effect the various layers of soil and their densities to avoid injecting on top of loose soil. Pressure Grout injection in the wrong place can actually exacerbate the problem, by adding weight on top of the incompetent soil. Geotechnical borings should be done in advance of any grouting to help the engineer make sound decisions. The engineer should then inspect the process to insure that his parameters are followed and sign off and stamp the project on completion. 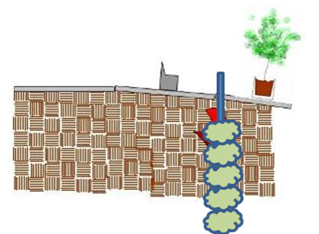 The process is similar in practice to slabjacking, however instead of grouting only under the slab or filling the hole, we drive the tube to a predetermined depth, and pressure grout the weak soils making them more stable. This also can be beneficial to fill voids in very rocky soils that traditional piering may not be suitable for. For soil stabilization know the proper technique. 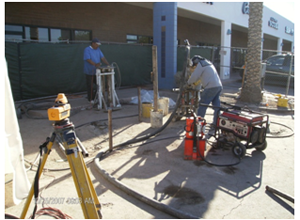 Grout Compaction Services by Arizona Foundation Solutions! 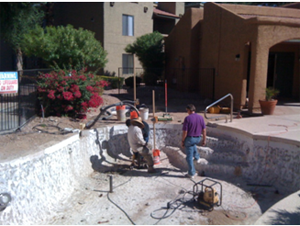 Arizona Foundation Solutions is the leading contractor for underpinning in the State of Arizona and for several years now we have helped thousands of residents stabilize and raise their sunken foundations. Maybe you are having issues with sink holes or unstable soils? Arizona Foundation Solutions has been performing this technique for years now. Read more about sink hole issues on this Fox News Report. We have successfully grouted pavements, building slabs, bridge approach slabs, house floors, pools and other similar types of infrastructures. Our crew is experienced, hard working, and careful. As you run into soil problems of any type, please call and challenge us to bring you the right solution to each problem providing durable soil stabilization.